WTK: Value of a C&R transferrable MG34. I have a chance to buy a fully transferrable C&R MG34. I have been out of the MG hobby for awhile so am not sure what the going price is now. The gun is not matching but runs fine and still retains about 70% blue. Thanks in advance. Ohio ordnance sold one last year for $20,000. Wish I had bought it. Well with absolutely no information provide about the gun your are considering, value can run from about $15K to probably $35K……..
What do the cams look like in the receiver? 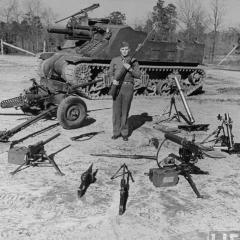 If its just a mix master like most of the guns are especially DOT 43/44/45 what condition are the other parts in? Don't have any pics, nothing matches, barrel shroud is cra 1942. Doesn't appear rewatted to me, but I'm no expert, ejector plate is not the original plate, it's in the white whereas the rest of the receiver is blued, cams look good, quite a bit of bluing left on all the parts considering it's 70 some odd years old. Comes with three barrels, an original Lafette (has the spare bolt box, but no scope or slings), an extra bolt, a belt filler, and a bunch of assorted other stuff.